Home > Resources > Transfer > How to Transfer WhatsApp Messages from iPhone to Android? It is a wonderful moment when you have a new phone. As more and more users switch to have an Android phone, a problem about how to transfer app data can always cause a trouble, especially for those users who switch from iPhone to Android. You know, transferring app data, such as WhatsApp messages, from iPhone to Android is still a tough problem. However, you can transfer WhatsApp messages from iPhone to Android by the following guides. What's more, an additional tip on transferring WhatsApp messages from Android to iPhone is also included. 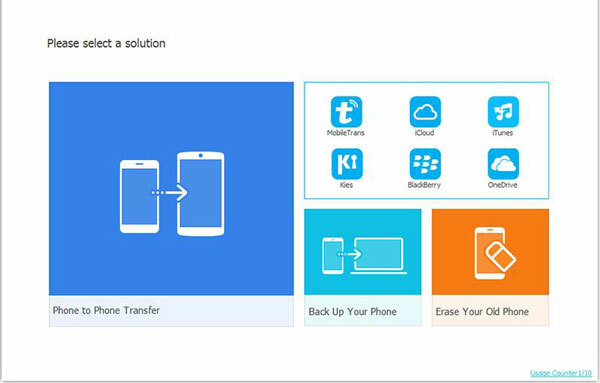 iCloud to Android Transfer is a professional software for transferring data from iCloud to Android. Its all around functions support selectively and completely one-click moving many formats of files from iOS to Android, including Apps, App data, contacts, call logs, text messages, photos, music, videos and calendars. So if you have synced WhatsApp to iCloud, you can use this program to transfer whatsApp messages from iPhone to Android. It can convert media files to be compatible with the target Android device. You can keep both the original data and the moved files safely. Step 4. Sign in iCloud with your Apple ID and password on the left panel. The iCloud account must be the one that you used to backup your WhatsApp, or not, you can not get the backup WhatsApp messages back from it. In this step, please make sure there is a "Connected" word under your Android phone on the interface, if not, please replug it. Step 5. Enter your iCloud account and select the app data on the list of backups, you can also select other files you want to move to Android device, please click "Start Transfer". Please notice that do not disconnect your Android phone until the transferring process is completed. After that, you can find out the WhatsApp massages from the app data you have downloaded from iCloud. An easy way to transfer WhatsApp messages from iPhone to Android is to backup WhatsApp on iPhone, then uninstall the app, and download it again on your Android phone. A prompt window will pop up to ask you to restore WhatsApp data on your Android phone, or not, you can never get the backed up WhatsApp files back. Just select "Restore" and job is done. Step 1. Run WhatsApp on your iPhone. Step 2. Take a manual backup by clicking "Settings" > "Chats" > "Chat Backup" > "Back Up Now" to start to backup your chat history to iCloud. Step 3. 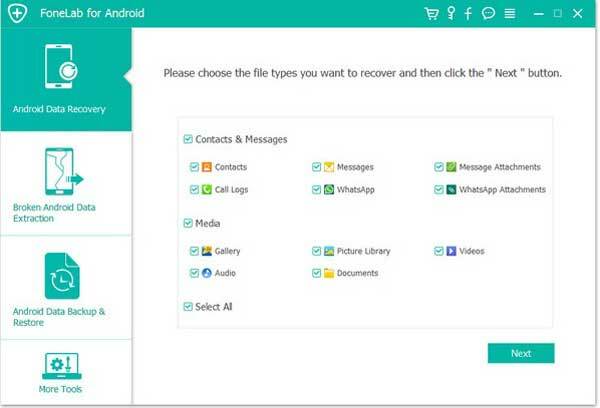 When the backup process is completed, you can uninstall WhatsApp from your iPhone and download it from Google Play store to your Android phone. Step 4. Install and then run WhatsApp on your Android phone. Please use the same WhatsApp account as the one you used on iPhone. Step 5. A pop up window will ask you to restore WhatsApp data, please simply tap on "Restore" to complete moving WhatsApp messages from iPhone to Android. A feature of WhatsApp allows you to transfer chats via Email from iPhone to Android. It is also easy to navigate, but please notice that by this way, you can only view these chats on your Android phone. It does not support you to sync these old conversations with WhatsApp on your Android device. Step 2. Please go to "Settings" > "Chat Settings" > "Chat History" > "Email Chat". Select WhatsApp chats that you want to send to Android phone by an Email. Step 3. The transfer process will take for a while, depending on your internet connection and file size. You can just choose "Without Media" or "Attach Media" in this step as you like. Then, type in your Email address and send it. Step 4. Log in the Email on your Android, you can find the Email you just sent and view the WhatsApp messages. Two tools are involved in this way - iBackup Viewer & WazzapMigrator. Besides, please make sure that you have iTunes installed on your computer. Please notice that WazzapMigrator is a paid app on Google Play, if you do not plan to paid for it, you can use the ways mentioned above in Part 2 and Part 3. Step 1. Backup your iPhone with iTunes. Please launch iTunes and connect your iPhone to computer via a USB cable. Then, please choose your device and go to "Summary", click "Back Up Now". Please do not tick encrypt backup option in this step. Step 2. Use iBackup Viewer to extract WhatsApp backup files to your computer. Please install and run iBackup Viewer on your computer, choose your device and find out a file named WhatsApp.Share from the file list and export it. If you want to transfer the attachments, please choose media folder from the WhatsApp folder and export it. Step 3. Connect your Android phone to computer, please send WhatsApp.Share and the media folder (if needed) to the "Download" folder on your Android device. Step 4. Download WazzapMigrator app from Google Play store and install it on your Android phone. Step 5. Run the app and turn to "Select iPhone Archive" to choose the messages you want to transfer. The process will start automatically. You can easily complete the data transferring after converting these archives to WhatsApp/ Databases folder. 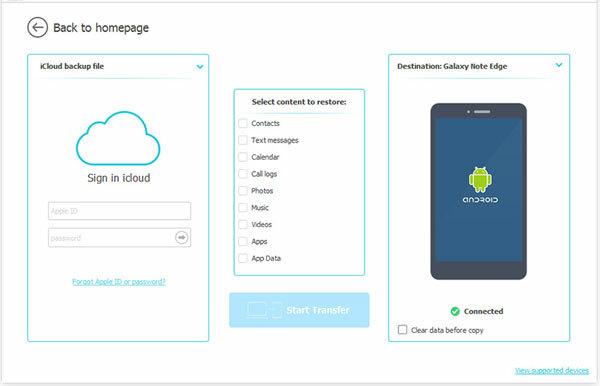 If you want to transfer WhatsApp messages from Android to iPhone, that Android WhatsApp Data Transfer is a professional software for you. This application can transfer WhatsApp and its attachments, contacts, call logs, text messages, messages attachments and media files from your Android device to computer. 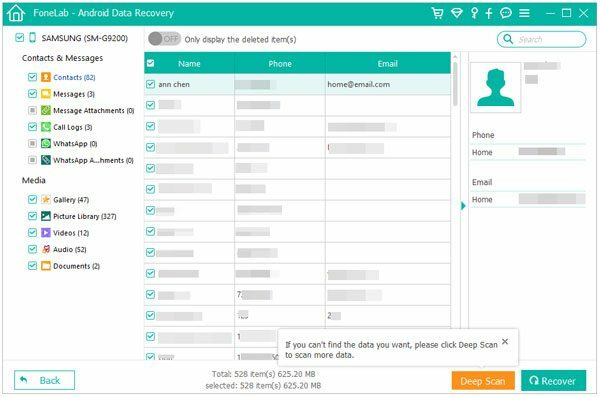 It is also a good tool for Android data recovery. The program supports many brands with Android OS from Android 2.3 to Android 8.0, including Samsung Galaxy S8/ S7/ Galaxy Note8, Moto Z2 Play/ Moto Z, HTC U11, Sony Xperia X, LG Q8, Huawei P10, Xiaomi Mi 6 and so on. Step 1. Please download and install Android WhatsApp Data Transfer on your computer, here are two free trial for Windows/ Mac, you should choose one according to your computer operating system. Step 2. Run the program and connect your Android phone to computer via a USB cable. Step 3. Enable USB debugging as the prompts shown in the interface. 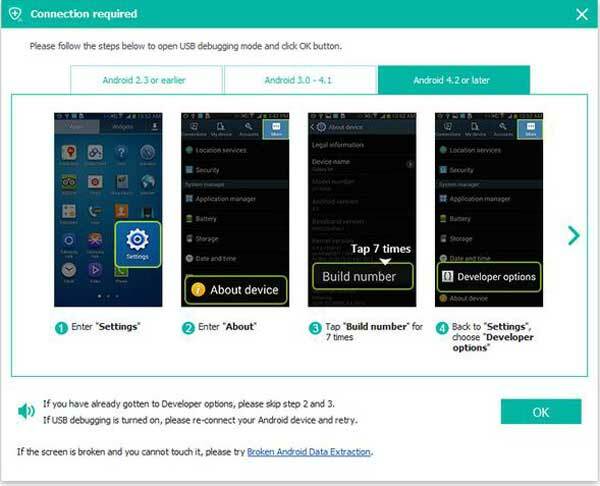 The program will give a simple guide on how to enable USB debugging on Android phones. Step 5. Please choose the files and check the detailed items you would like to transfer, then click "Recover" to extract them from Android phone to your computer. The rest thing is to upload your WhatsApp messages and attachments to iCloud and sync them to your iPhone.